How the ACLU Plans to Spend that Extra $79 Million—and Counting! “Justice for All March (Dec. 13, 2014)” by Fusebox Radio. 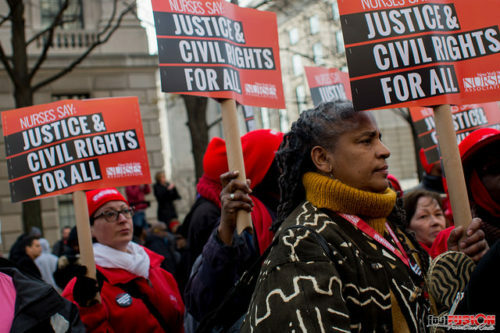 As the country prepares for a long-haul fight in multiple venues over civil and human rights, the American Civil Liberties Union is at the center of the battle. As many people agreed, the ACLU seems to have needed a war chest. Since Election Day, the ACLU has received a remarkable $79 million in new contributions online, and the funds, while necessary to support a heightened level of activity, are also shaping the next wave of activism in response to the new administration. Last year, the organization reported receiving about $105 million in grants and contributions out of its $138 million budget, so the recent surge in donations represents a potential 35 percent increase in the ACLU’s coffers. The organization also seems to have gained coveted social media followers over the past three months, with more than 1 million people following its page on Facebook and a Twitter following that tripled in size. Executive Director Anthony D. Romero recently shared how the ACLU envisions its next phase of growth to scale up and “build a war chest for future battles,” including $40 million toward state offices and the hiring of 100 new staff members, particularly in what they consider to be battleground states: Florida, Texas, Ohio, Pennsylvania, and Georgia. A “second tier” comprises lower priority states of Arizona, Colorado, Kansas, Michigan, Missouri, North Carolina, and Virginia. With the surge of new members, we now have a growing army of people who don’t just want to write a check. They want to join the fight. We will be asking our volunteers and members to join our team and partner with us to do grassroots calls-to-action, local town halls, lobby days, acts of protest, and engagement on our core priorities. The ACLU will spend another $21 million on lawyers and staff at its headquarters in New York, plus $5 million on infrastructure, offices, and operations. Of course, Romero made sure to note that the ACLU has an appropriate ratio of overhead, in direct conflict to NPQ’s extensive advocacy efforts to stop the overhead obsession. “Rest assured that we will put the bulk of the money into real programs: Our program/management ratio is 86 percent program, 14 percent management, including fundraising,” he said. We are still the David to the government’s Goliath. We have 300 litigators on payroll nationwide—100 of them in our headquarters. The government has over 19,000 lawyers on its payroll. There are lots of fun trends to unpack in examining the ACLU’s success. Liberal lawyers have become progressive heroes. Resistance in the form of cash (also known as rage donations) is on the rise, including boycotts, cash-pologizing (in the case of Uber), unsolicited donations like this trolling-for-dollars case, and a creative use of the Amazon Dash button to make micro-rage donations all day long. Determined to make legal resistance one of the defining attributes of the Trump era, lawyers at liberal advocacy groups have been putting aside institutional rivalries and organizing to work together on litigation. Several leaders of the effort said their hope is that the judiciary may serve as a strong check to a government controlled by Mr. Trump and his fellow Republicans in Congress across a broad range of anticipated fights. The ACLU has been out in front of other progressive groups since the election, as we’ve reported. It published a full-page letter in the New York Times on November 11th to make its position clear (explicitly asking Trump to reconsider his campaign promises) and launched a #PeoplesOath campaign this month to build on the momentum. It’s since become a cause célèbre, joining the next class of the famed Silicon Valley startup accelerator Y-Combinator and receiving a tidal wave of donations from tech executives and other well-heeled sympathizers. The sudden infusion of cash to the century-old organization is as heady as it is welcome. Like all nonprofits, the ACLU needs to avoid using what could be one-time money to commit the organization to ongoing programs and expenses that could be the cause of a future funding crisis.